New lower price! This DVD set, which contains 32 lessons each 30 minutes long, is presented by Fr. Pablo Straub, C.S.S.R. He is the Redemptorist founder of two Mexican religious orders, one for men and one for women, both contemplative and missionary. 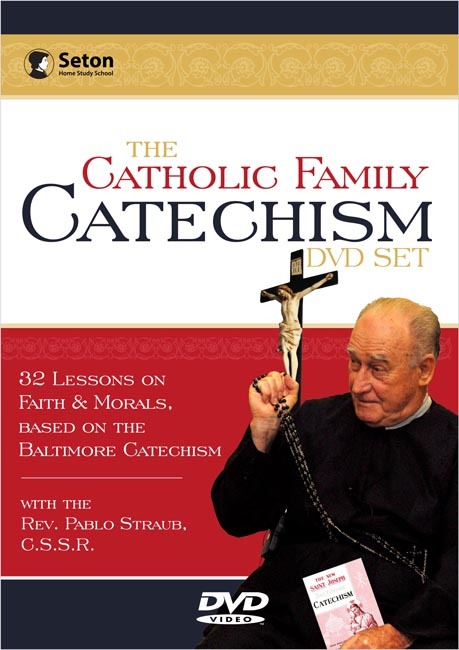 Father's warmth, simplicity, and zeal permeate these easy-to-follow presentations covering the chief doctrines of the Catholic Faith based on the question/answer format of the Baltimore Catechism. Father has spent over twenty years evangelizing throughout the Americas, has directed numerous retreats and missions, has spoken at various Eucharistic and Marian Conferences, and his taped shows are favorites on EWTN. Viewing this Catechism series is a wonderful opportunity for the entire family to deepen their understanding of the Faith. Known as the "Crucifix Priest," Father's trademarks include his deep love of Jesus in the Blessed Sacrament and Confession, his devotion to the Blessed Mother, and his fidelity to the Holy Father. He is sure to educate and captivate children and adults! 4-disc set. Eight half-hour lessons per disc. After watching the first episode, I loved the series. I've never heard of Fr Pablo Straub, nor seen him speak before, but I was immediately taken by his intimate, warm and inviting attitude. He actually grins and laughs in teaching you, and feels like he's in the same room. He comes across as a kindly grandfather, gathering children around his knees in a Mexican plaza in the evening, regaling them with stories and examples from the Catechism. The visual quality is low, filmed on VHS a decade ago, but the audio is clear and the content strong. A good idea for a daily half-hour with the family! My two oldest children - daughter using Baltimore Catechism #1 and son using the Baltimore Catechism #2 - viewed these videos throughout the school year as they were studying the different topics in Religion class. The first thing I noticed with the first couple of videos was the inferior picture quality likely because the videos were produced before the high definition television we have become accustomed to. But, as time goes on, BELIEVE ME, you completely forget about the picture quality. The content is so good, and Fr. Pablo is the best! If you would like the benefit of having a holy priest come into your living room to teach your children the catechism on a regular basis, this video series is for you! I am so glad I decided to make this purchase for our family, and definitely plan to continue to use the videos for the younger children!